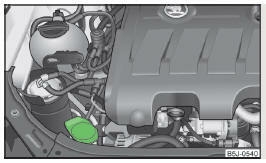 The windscreen washer fluid reservoir is located in the engine compartment » Fig. 127. This contains the cleaning fluid for the windscreen or rear window and for the headlight cleaning system. The capacity of the reservoir is about 3.5 litres or about 5.4 litres on vehicles that have a headlight cleaning system 1). Clear water is not sufficient to intensively clean the windscreen and headlights. We recommend using clean washing water together with the screen cleaner from the range of ŠKODA Original Accessories (in winter additionally with antifreeze) which is capable of removing stubborn dirt. The washing water should always be mixed with antifreeze in winter even if the vehicle has heated windscreen washer nozzles. Under exceptional circumstances, methylated spirits can also be used if no screen cleaner with antifreeze is available. The concentration of methylated spirits must not be more than 15 %. The freeze protection at this concentration is sufficient only to -5 °C. Under no circumstances must radiator antifreeze or other additives be added to the windscreen washer fluid. If the vehicle is fitted with a headlight cleaning system, only cleaning products which do not attack the polycarbonate coating of the headlights must be added to the windscreen washer fluid. Do not remove the filter from the windscreen washer fluid reservoir when replenishing it with liquid otherwise the liquid transportation system can be contaminated, which can cause the windscreen washer system to malfunction.